The E-MICRO-T features an integrated temperature sensor, 2 RJ45 temperature/humidity sensor ports & 2 dry contact inputs. 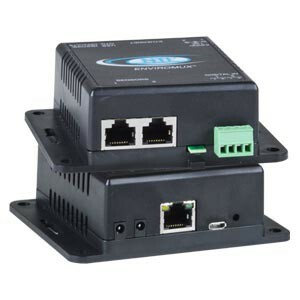 The E-MICRO-TRHP features an integrated temperature/humidity sensor, 2 RJ45 temperature/humidity sensor ports, 2 dry contact inputs & built-in Power over Ethernet (PoE). Use independently or as an IP-connected remote sensor for the E-2D/5D/16D. Also known as: Remote Environment Monitoring System, monitor networking closets, server room alert, IP temperature sensor, humidity sensor, computer room humidity probe. The ENVIROMUX® Micro Environment Monitoring System (EMS) monitors critical environmental conditions, such as temperature, humidity, liquid water presence, power, intrusion, and smoke. When a sensor goes out of range of a configurable threshold, the system will notify you via email, web page, network management (SNMP), and/or SMS messages (via external USB 3G modem). The system functions independently or as an IP-connected remote sensor for the E-2D/5D/16D. The E-MICRO-T features an integrated temperature sensor, two RJ45 sensor ports for external temperature/humidity sensors, and two dry contact inputs. The E-MICRO-TRHP features an integrated temperature/humidity sensor, two RJ45 sensor ports for external temperature/humidity sensors, two dry contact inputs and built-in Power over Ethernet (PoE). Monitor (ping) up to 4 IP network devices – alerts are sent if devices are not responding. Integrates with various Open Source SNMP monitoring packages -Nagios and MRTG. USB port for connecting USB modem. Security: HTTPS, TLS v1.2, AES 256-bit encryption, 16-character username/password authentication, user account restricted access rights. 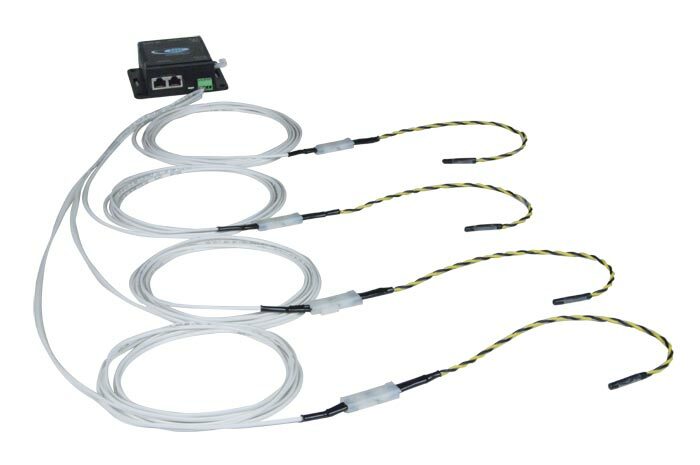 Two RJ45 modular jacks for connecting temperature sensors or combined temperature/humidity sensors. Three levels of user-defined alerts – normal, warning, critical. Two screw terminal pairs for connecting dry contact devices and the liquid detection sensor. HTTP/HTTPS, SNMP V1/V2c, SMTP, TCP/IP, Syslog, SNTP, DHCP, TLS v1.2, AES 256-bit, 3DES, Blowfish, RSA, EDH-RSA, Arcfour. An IP address can be assigned to the E-MICRO automatically by a DHCP server. Applications from -4 to 167°F (-20 to 75°C). ±0.72°F at 14 to 167°F (±0.4°C at -10 to 75°C). ±0.9°F at -4 to 14°F (±0.5°C at -20 to -10°C). Applications from 0 to 90% relative humidity at temperatures between -4 to 167°F (-20 to 75°C). WxDxH in (all options): 4x3.44x1.37 (102x87x35 mm). Includes mounting holes to match rack hole spacing. When connected as an IP remote sensor for an E-2D/5D/16D unit, the E-MICRO is configured via the E-xD web interface. All sensors connected to the E-MICRO can be viewed on one summary page. Telnet can be enabled or disabled. Network Security Enhancement: Disabling Telnet can prevent unsecure text menu access to the E-MICRO. Optional Android App provides an easy-to-use interface for monitoring sensor statuses and acknowledging/dismissing sensor alerts from many E-MICRO units. How to Monitor and manage server room environmental and security conditions over IP. The E-MICRO-T(RHP) Remote Temperature/Humidity Sensors over IP can function as an IP-connected remote sensor for the E-5D. To add a remote IP sensor, access the web interface and select Monitoring > IP Sensors. Click on the "Add New IP Sensor" link on the bottom and key in the description and IP address of the E-MICRO-T(RHP) to connect it to the E-5D. Up to eight remote IP sensors can be connected. All sensors connected, including the Remote Temperature/Humidity Sensors over IP, to the E-5D can be viewed on one summary page. Each screw terminal pair on the E-MICRO-T(RHP) Environment Monitoring System (EMS) will support up to four rope-style liquid detection sensors. "We had a small leak last week, and the E-MICRO-T environment monitoring system alerted us like it was designed - saved us hours and hours of cleanup." "The E-MICRO-T temperature sensors are working great! They have notified us a number of times of excessive heat where our equipment is located." "We like that the E-MICRO-T Environment Monitoring System is very simple to integrate. We also like the fact that we will be able to expand the number of sensors if needed in the future by using the optional management software."